One has to dig really deep to find anything possibly wrong with the production of Suffield Players "All My Sons." With the use of a spyglass, there are only two areas that could be improved upon - the trellis on the set and page 5 of the program book. More later. "All My Sons," Arthur Miller's second play, is one of the single most dramatic and powerful plays written to date. Riveting, emotional, and gritty are words to describe this post-WWII story. The plot is about two families. Yet, Miller tackles something bigger than all of us and cuts to the core of morality. The play opens on what looks like a real yard and fully built backdrop of a kitchen. Family members and neighbors come and go as the play unfolds. Humor is gradually replaced by somber tones and ultimately and painfully to solid stillness onstage and in the audience. Miller wastes no words as we learn about patriarch Joe Keller, his wife, and son; and Ann and George Deever, former neighbors. Each comes with his/her own pack of secrets, lies, and sense of justice. They crash against each other on the battlefield of this backyard. Words as sharp swords draw blood and tears. This is drama at its best. Director Ed Wilhelms cast the finest actors to portray their personal best as well as ensemble best. Konrad Rogowski's Joe inwardly smolders with a sense of righteousness and guilt. He is the crux of the play. Marge Patefield's Kate (Joe's wife) becomes eaten alive by her own secrets. Rayah Martin and Shaun O'Keefe are the young lovers with the weight of sorrow on their backs - not the expected joy. It is very hard to imagine any of these actors performing better than they did on opening weekend, except perhaps next weekend. Oh, to the two "faults." The trellis is too busy, with its natural criss-cross design, sometimes distracting the audience from the actors seated by it. And, advice to future audiences - don't read page 5 in the program as it's a spoiler. 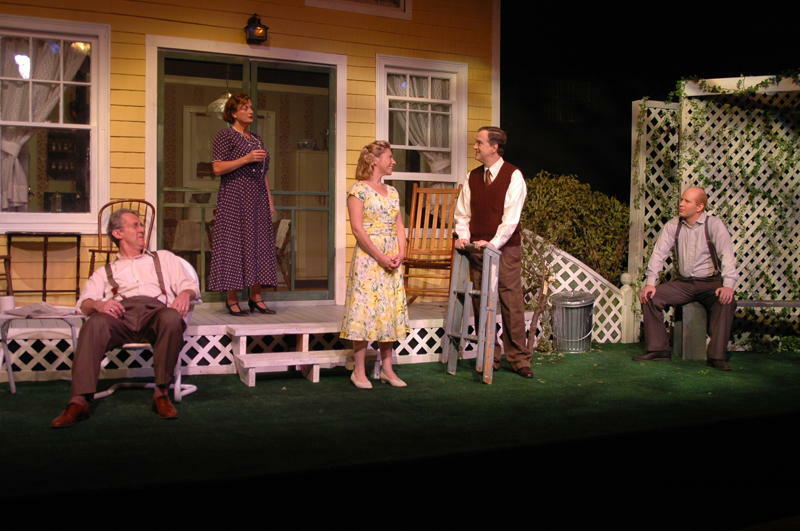 "All My Sons," however, is no spoiler, but the best community theatre seen in many years.